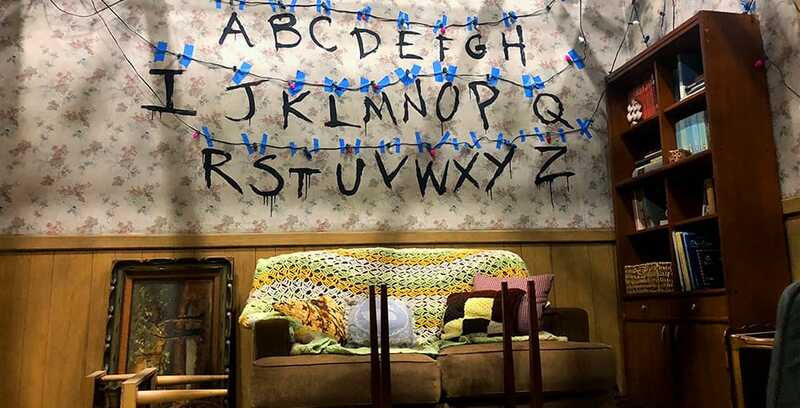 Coming to Halloween Horror Nights (HHN) at Universal Studios Hollywood this year is the highly-anticipated “Stranger Things” maze. Last week we shared a first-look at the maze, but a behind the scenes look with HHN Creative Director and Producer John Murdy gives us some insight on how this maze came to be. Behind the scenes look at the iconic “Run” scene from the “Stranger Things” maze. SPOILER WARNING! This article contains spoilers for Universal Studios Hollywood “Stranger Things” maze. If you do not wish to know anything whatsoever about this house before experiencing it, do not read any further! “Stranger Things” creators Matt and Ross Duffer were already fans of Halloween Horror Nights, which made the collaboration with Murdy’s team seamless when it began last December. 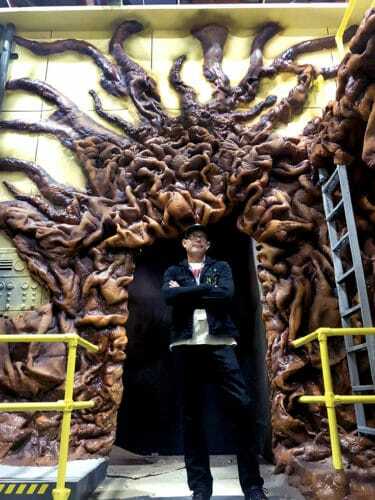 Murdy had full access to tens of thousands of set photos, sound clips and original sculpts to recreate the sets as accurately as possible. The Byer’s house, for example, feels like a time capsule. Prop masters spent weekends at flea markets and yard sales to find era-appropriate furniture and trinkets to compliment authentic linoleum flooring. Even Will’s retro bedroom wallpaper is exactly what you see on screen. What makes this house particularly impressive is the translation of visual effects into practical effects. The Upside Down on television is a digitally created space, but Murdy and his team found creative ways to bring that to the real world. To mimic the floating dust particles, individual fiber optic lights are cleverly diffused with cotton balls and will be gently blown with fans around the room. Those glowing orbs combined with projections and show backgrounds make the alternate dimension a reality. “Stranger Things” is also the first house in a sound stage for Universal Studios Hollywood since Aliens vs Predators. The extra height and controlled lighting environment make a huge impact of the production design. Eleven’s visit to the void can now be darker than ever, but the Hawkin’s Lab is really where Sound Stage 29 shines. The walls tower at least twice as high as the tented mazes, making the entrance to the void even more daunting for guests as Dr. Brenner confirms that everything is OK.
John Murdy stands mid-construction of the Hawkins Lab. The “doctor” is one of several live actors throughout the maze. But one of Murdy’s biggest challenges was how to incorporate the main characters – the children. “Obviously you have to be 18 to work Horror Nights, so it doesn’t really work to have 20-year-old Dustin in a wig,” Murdy explained. To get the presence of the kids into the show, the team came up with some creative solutions. During the first scene, guests will hear their voices through the walkie talkies used so frequently in the show. The “Stranger Things” maze is surely to be the most talked about haunted house at HHN this season. With so many different forms of the Demogorgon – and how frequently he shows up – Murdy transformed a not-too-scary pop culture hit into a maze. Those brave enough to visit will stay on edge in anticipation of what will happen next. Halloween Horror Nights at Universal Studios Hollywood begins September 14. Tickets are on sale now. Halloween Horror Nights at Universal Orlando will also have their own take on a Stranger Things house.